This year's Boston Poetry Marathon is coming up in just over a month. And this year, I am one of the organizers, or "co-poet wrangler" as my friend and fellow organizer Andrew K Peterson calls it. Suzanne Mercury and Gillian Deveraux are the other organizers this year. We're hard at work behind the scenes getting everything ready. 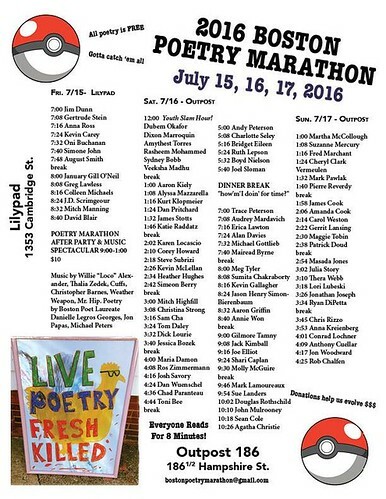 The Boston Poetry Marathon 2017 event will be at Outpost 186 in Cambridge's Inman Square on all three days this year. We will have more details coming soon. We will have a schedule in a few weeks. Because I love making order from chaos, I'll be doing the schedule. My co-organizers are working on press releases, Twitter posts, Instagram posts and firming up arrangements for everything with the venue. Invitations have been sent and the line-up is coming together. I am so excited! Which reminds me of that episode of Saved By the Bell when Jessie Spano has way too many things going on and ODs on stimulants until she has a break down in Zach's arm, "I'm so excited. I'm so excited. 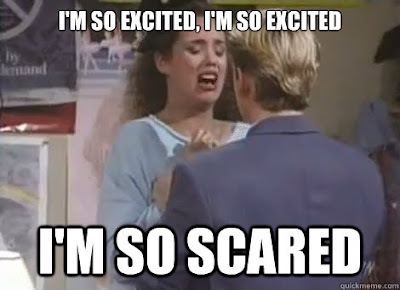 I'm so...so...scared." I'm not scared but OMG, girl, I can related. Too bad they didn't have Dunkin Iced Dark Roast Medium with one hazelnut, one mocha, extra almond milk and an espresso shot back in the early 90s. Who needs speed pills when there's massive amounts of caffeine to consume? This meme is my life right now, in a nutshell. Except I'm not scared, just bonkers. Sleep is for September, I keep telling myself.